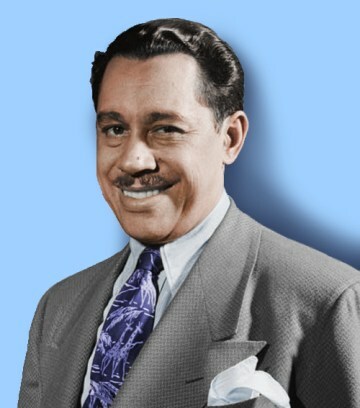 Born Cabell Calloway on December 25th, 1907, in Rochester, New York. He died November 8th of 1994 in Cokebury Village, Delaware. Involved in show business from an early age, vocalist Calloway was an occasional drummer and MC, working mostly in Baltimore, where he was raised, and Chicago, where he relocated in the late 20s. He worked with his sister Blanche, and then, in 1929, he became frontman for the Alabamians. Engagements with this band took him to New York; in the same year he fronted the Missourians, a band for which he had briefly worked a year earlier. The Missourians were hired for New York's Savoy Ballroom; although the band consisted of proficient musicians, there is no doubt that it was Calloway's flamboyant leadership that attracted most attention. Dressing outlandishly in an eye-catching "Zoot Suit" - knee-length drape jacket, voluminous trousers, huge wide-brimmed hat and a floor-trailing watch chain - he was the centre of attraction. His speech was peppered with hip phraseology and his catch phrase, "Hi-De-Hi", echoed by the fans, became a permanent part of the language. The popularity of the band and of its leader led to changes. Renamed as Cab Calloway And His Orchestra, the band moved into the Cotton Club in 1931 as replacement for Duke Ellington, allegedly at the insistence of the club's Mafia-connected owners. The radio exposure this brought helped to establish Calloway as a national figure. As a singer Calloway proved difficult for jazz fans to swallow. His eccentricities of dress extended into his vocal style, which carried echoes of the blues, crass sentimentality and cantorial religiosity. At his best, however, as on "Geechy Joe" and "Sunday In Savannah", which he sang in the 1943 film Stormy Weather, he could be highly effective. His greatest popular hits were a succession of songs, the lyrics of which were replete with veiled references to drugs that, presumably, the record company executives failed to recognize. "Minnie The Moocher" was the first of these, recorded in March 1931 with "Kickin' The Gong Around", an expression that means smoking opium, released in October the same year. Other hits, about sexual prowess, were Fats Waller's "Six Or Seven Times" and the Harold Arlen -Ted Koehler song "Triggeration." For the more perceptive jazz fans who were patient enough to sit through the razzmatazz, and what one of his sidemen referred to as "all that hooping and hollering', Calloway's chief contribution to the music came through the extraordinary calibre of the musicians he hired. In the earlier band he had the remarkable cornetist Reuben Reeves, trombonist Ed Swayzee, Doc Cheatham and Bennie Payne. As his popularity increased, Calloway began hiring the best men he could find, paying excellent salaries and allowing plenty of solo space, even though the records were usually heavily orientated towards his singing. By the early 40s the band included outstanding players such as Chu Berry, Hilton Jefferson, Milt Hinton, Cozy Cole, and Jonah Jones. Further musicians included Ben Webster, Shad Collins , Garvin Bushell , Mario Bauza , Walter "Foots" Thomas , Tyree Glenn , J.C. Heard and Dizzy Gillespie, making the Calloway band a force with which to be reckoned and one of the outstanding big bands of the swing era. In later years he worked on the stage in Porgy And Bess and Hello, Dolly!, and took acting roles in films such as The Blues Brothers (1980). His other films over the years included The Big Broadcast (1932), International House (1933), The Singing Kid (1936), Manhattan Merry Go Round (1938), Sensations Of 1945 (1944), St. Louis Blues (1958), The Cincinnati Kid (1965) , and A Man Called Adam (1966). Calloway enjoyed a considerable resurgence of popularity in the 70s with a Broadway appearance in Bubbling Brown Sugar. In the 80s he was seen and heard on stages and television screens in the USA and UK, sometimes as star, sometimes as support but always as the centre of attention. In 1993 he appeared at London's Barbican Centre, and in the same year celebrated his honorary doctorate in fine arts at the University of Rochester in New York State by leading the 9,000 graduates and guests in a singalong to "Minnie The Moocher". Calloway died the following year.